Iowa-raised astronaut Peggy Whitson has announced her retirement from NASA (NASA photo). The Department of Aerospace Engineering and the Iowa Space Grant Consortium are joining with countless individuals and organizations worldwide to note the retirement, and accomplishments, of record-setting Iowa astronaut Peggy Whitson. 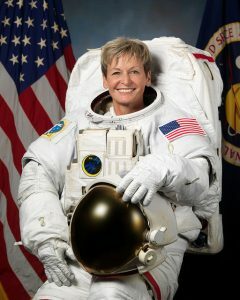 NASA recently announced that Whitson is retiring after more than 30 years of work with the space agency, which includes setting the mark for the most total number of days in space for any American astronaut (665), the longest space flight by any woman (289 days), the most space walks by a woman (ten) and being the oldest woman in space (age 57). She is also the first woman to command the International Space Station, and did so on two occasions. 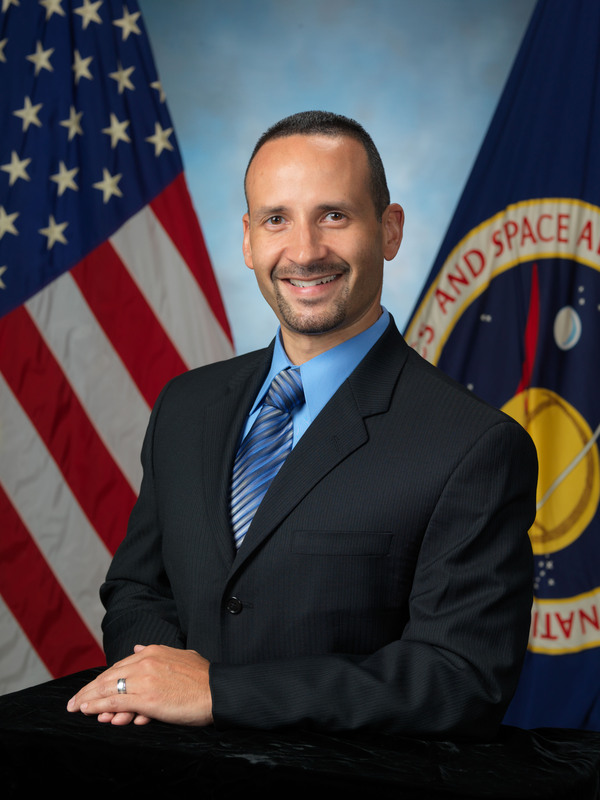 Tomas Gonzalez-Torres, an Iowa State alum and now a lecturer in the Department of Aerospace Engineering, has many fond memories of working with Whitson when he was a NASA flight director (NASA photo). Whitson, who is trained as a biochemist, received an honorary Doctor of Science degree from Iowa State University in December of 2013 and served as the commencement speaker at that ceremony. She visited Ames in 2003 with a traveling NASA Johnson Space Center exhibit called “Space Station Imagination” and met with officials of the Iowa Space Grant Consortium, based at Iowa State. Born in Mt. Ayr, Iowa, Whitson began working at the NASA Johnson Space Center in Houston in 1986 and was selected as an astronaut candidate in 1996. She served on three separate International Space Station expeditions – Expedition 5 in 2002, Expedition 16 in 2008 and Expedition 50/51/52 in 2016-17. Whitson is joined by Clayton Anderson (right), who is now a Distinguished Faculty Fellow in the Department of Aerospace Engineering and cosmonaut Yuri Malenchenko during International Space Station Expedition 16 in 2007. (NASA photo). Department of Aerospace Engineering lecturer Tomas Gonzalez-Torres, a former NASA flight director for space missions, had a significant working relationship with Whitson. “I had the privilege of working and being friends with Peggy Whitson for many years while at NASA,” he said. “I actually taught her one of her very first spacesuit classes, and then was the EVA (spacewalk) Lead Officer for her Increment 16 time in space. During that time Peggy and I worked to prepare and successfully execute five EVAs (Extravehicular Activities) toward the assembly of the International Space Station. Peggy and her crew were so successful and driven during her Increment as Space Station Commander that the ground teams were having problems keeping up with her. Throughout her entire NASA carrier Peggy continuously set the bar higher and higher, not just for herself but for everyone around her. Everyone, including myself, wanted to do the best job possible because we didn’t want to let NASA down and definitely didn’t want to let down Peggy. “I am extremely happy for Peggy on her successful retirement, and all of her achievements. While NASA will most definitely miss having Peggy around, I am thankful to have had Peggy at NASA knowing that her legacy and mentorship have now been set in the foundations of the current and future crewmembers, Mission Control flight controllers, and all others around NASA,” said Gonzalez-Torres. Iowa State aerospace engineering student Dillyn Mumme poses with Whitson during his Iowa Space Grant Consortium internship at NASA’s Johnson Space Center. Retired astronaut Clayton Anderson, who is a Distinguished Faculty Fellow in the Department of Aerospace Engineering, served with Whitson in space. “It was an honor to serve with Peggy in both inner and outer space,” he said. “Peggy was instrumental in helping me grow as a young astronaut. 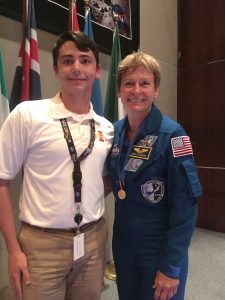 Having flown with her on ISS Expedition 16 in 2007, I was proud to help form the first Nebraska-Iowa crew — the world’s first Midwest Expedition!” said Anderson, who is a Nebraska native and received an M.S. in aerospace engineering at Iowa State.